I have had numerous viral video successes. I have been responsible for idea generation, through to storyboarding, filming, editing and then seeding the videos. Sometimes I have worked with little or no budget, literally recording and seeding on a phone - and other times I have worked as a producer sourcing outside vendors for larger scale shoots. Please scroll all the way to the bottom of the page. 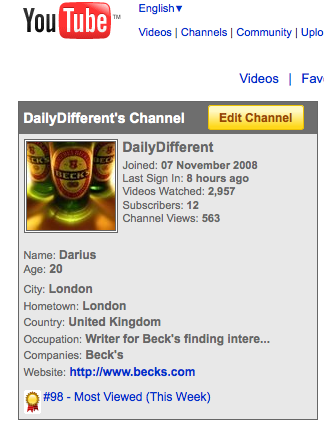 For the Daily Different (Beck's beer) YouTube channel, I wanted to create a cheap (very cheap just using my mobile phone) series of short entertaining, informative videos that promoted Beck's beer but not explicitly so. I was responsible for the idea generation, filming, editing, and seeding of the all the videos - and for managing the then nascent YouTube channel. At one point with ZERO budget the Daily Different YouTube channel was the 98th most viewed in the world. Total channel views at the time were 334, 213 but are now much higher. Please scroll across to see some of the videos. Ice Cold Beer in Two Minutes! After the success of my low budget exploits above - I was provided a significant budget to produce a high quality viral video. I wanted to create a viral video for Beck's beer but knew the branding had to be minimal for it to stand any chance of success and not just be completely ignored by the internet masses. I came up with the concept of "Maximum Pong" - the ultimate beer pong trick shot video. Working closely with an outside vendor on the storyboarding, music, and special effects this video at the time went viral with over 50 000 views in one day alone. Note the subtle Beck's advertising on the ping-pong ball, and watch out for a cameo from yours truly! Sadly due to rights issues this video is no longer on YouTube, however I have uploaded it to Vimeo for you to enjoy. Commissioned by YouTube themselves as part of YouTube Geek Week, Fanboys Anonymous was a sci-fi/pop culture comedy series that myself and my friends at Kill TV comedy created. I had a very hands on role with all aspects of production on these videos, from initial concept, storyboarding, location finding, casting (even starring in check me out in 'Addicted to YouTube' as a troll!) to sitting in on the editing process. These videos were all wildly successful with the most popular being Star Wars vs Star Trek Street fight which by the end of it's run on YouTube had over 1 million views alone. Please scroll across to see some of the videos.